The story of the apparitions of the Virgin Mary in Lourdes has been recorded in detail in handwritten documents. In the middle of the 1800s Lourdes was an obscure village in the south of France at the foot of the Pyrenees. The Soubirous family was reduced to poverty, when Monsieur Soubirous lost his job due to an accident at the water mill in which he lost an eye. The eldest child, Bernadette, was often sent to collect wood. On an icy day in February 1858, she saw a vision of a white lady in a grotto by the river. During the last of 18 apparitions, the lady revealed her identity, calling herself the Immaculate Conception. Each year, especially during the summer, special trains leave various European countries bound for Lourdes. Pilgrimage committees on a non-profit basis organize the trips. Lourdes has become the major pilgrimage center for the sick and infirm. Pilgrims make the journey with large groups of bedridden patients and the disabled. Helpers accompany them, including doctors and nurses, all volunteers. All day long a steady stream of tourists visit the site in the grotto where Mary appeared. Many people feel that drinking the water or bathing in it does them good. Many have been cured. This is the story of the two Marys, the mothers of the disciples John and Jacob, whose boat was shipwrecked off the coast of southern France. They had fled by sea after being banished from Palestine. Their boat began to sink near Les Saintes Maries de la Mer, a small town in the Camargue, where the river Rhone flows into the Mediterranean. According to the legend, Sara, a gypsy, watched from the beach as the boat foundered. She spread her cloak and both Marys safely reached shore. They told Sara of Christ's resurrection, and Sara asked the women to baptize her. Every year tens of thousands of gypsies from all over the world come to Les Saintes Maries. They come to worship their patron saint, the woman they call Saint Sara. In the morning they visit the crypt where the statue of Sara is displayed. Later in the day the statue is taken from the crypt and carried out to sea accompanied by a grand procession of gypsies. Although Sara has not been formally recognized by the church, it has made a gesture, declaring May 24th as Sara's official saint's day. The history of Amsterdam as an ancient place of pilgrimage dates to the Middle Ages. In the 13th or 14th centuries, Amsterdam was nothing but a small settlement at the mouth of the river Amstel. It was also called Miracle City, and it owes that name to the Miracle of the Holy Sacrament. On March 13th, 1345, a dying man was given the Sacrament of the Sick in his house on Kalverstraat. He confessed and received Holy Communion. Afterwards he ate and was sick. He vomited and the bowl was emptied in the fire. The sacred host floated above the flames, unscathed. The priest was called, who took the host back to the church, but twice the host returned inexplicably to the house of the sick man. The priest saw the hand of God in this and decided to return the host in a solemn procession. A chapel was built on the site of the miracle. Medieval Amsterdam grew into an important place of pilgrimage. And every year still, on the 3rd Saturday in March, thousands of pilgrims from all over the Holland take part in the procession. Most arrive by bus or train. But in many of the smaller towns surrounding Amsterdam the entire journey is made on foot, some pilgrims walking as many as 40 miles to reach Amsterdam. The history of Fatima can be traced to the beginning of the 20th Century. Three children witnessed the sudden appearance of the Holy Virgin beneath an oak tree. They described her as a "lady of white light." Mary instructed the children to recite the rosary every day. She appeared to them five times again that summer, her last appearance marked by a miracle, the miraculous "solar phenomenon" of Fatima. Several years after the appearances, two of the three children died. Lucia, ten years old at the time of the appearance, joined the Carmelite order of nuns. Her mission was to proclaim the message she had received from the Holy Virgin to the world. Fatima has become the most important destination for pilgrims in Portugal, attracting over a million and a half travelers yearly. The trek to Fatima is usually done in exchange for a favor received. Pilgrims often make a promesa, a personal vow to do penance as a sign of their gratitude to the Virgin. For many, this means covering the last 500 yards on the marble floor to the Chapel of the Apparitions on their knees. Unlike any other story about Jesus, this feature-length film traces the life of Mary in her many roles - as mother to Jesus, wife of Joseph, and inspiration to all. Trace the steps of a simple, young girl from Galilee visited by the angel Gabriel who announces to here that she will give birth to a son, Jesus. Watch, from her unique perspective, as Jesus teaches, heals, and ministers, only to be later betrayed, humiliated, and finally crucified...by the very people He came to save! Even so, one can only believe that if she had known all she would suffer as Jesus' mother, Mary would have given the same response, "I am the Lord's servant, and I am willing to do whatever He wants." In religion class a young student learns about how to make a rosary. But later when he tries to write summaries of the mysteries at home, he finds himself at wit's end. Fortunately, our angel appears once again to help him understand the devotion and the meaning of the mysteries in the life of Christ. Presented in segments corresponding to the mysteries. Jesus Grows Up :This delightful video in storybook animation follows the Joyful Mysteries of the Rosary as it tells the tale of Jesus� early years. Based on the book by Pilar Paris, Joseph M. Lozano, and Maria Ruis, the enchanting artwork and rich characters make it easy for youngsters to relate to young Jesus as he learns carpentry, plays with his friends and loves his parents. Jesus: What He Said, What He Did :From the authors and illustrator of Jesus Grows Up, here�s the rest of the greatest story ever told for young children! Following the Bible, you�ll see Jesus� Baptism in the Jordan River, the parables of The Prodigal Son and The Good Samaritan, The Sermon on the Mount, Crucifixion and Resurrection. 2-D animation brings the charming artwork to life in an appealing and approachable introduction to the life of Christ for little ones. Includes leader�s guide. The Visit to the Sepulcher is sung in the original Latin. The DVD includes English, French and Spanish subtitles. It is the 12th century. Easter dawns along the Loire Valley of central France. A choirmaster has set to music the familiar story of the hesitant and mournful visit of the three Marys to the tomb of Christ. As the Easter sun rises, his play is performed in the church he loves and serves, the Abbaye St. Benoit de Fleury. Over several centuries, similar versions appear at Easter services in many European and British churches. During the French Revolution the original Fleury manuscript is brought to the library at Orleans for safekeeping, where it is treasured to this day. Now, this inspiring medieval music drama is lovingly resurrected in a touching performance filmed at the place of its birth: the peaceful Romanesque abbey on the Loire. In our personal longings for the fullness of life, often a mysterious cry for maternal love springs from the human heart. Is it possible that a spiritual mother could allay the tears and fears of the people of the third millennium? In the sixteenth century, Our Lady of Guadalupe miraculously appeared to a poor little man named Juan Diego. Through her motherly love, she offered him great consolation. Her appearance and miracles lead to the conversion of millions of indigenous people. But does Our Lady of Guadalupe have any relevance to the people of the third millennium? Does her message of salvation and peace cross cultural barriers or is she only the Mother of Mexico? Is she as Pope John Paul II said, "The Mother of America?" �Pero que importancia tiene Nuestra SeÀora de Guadalupe para la gente del tercer milenio? �Serö ella "La Madre de Am¹rica" como lo dijo el Papa Juan Pablo II? Our Lady of Guadalupe, Mother of America explores the significance of the Blessed Mother�s appearances to St. Juan Diego. This documentary proposes that Our Lady of Guadalupe is the answer for all Americans who are seeking peace, the good things in life and even eternal life. In Our Lady of Guadalupe, Mother of America, you�ll experience the feast day of Mary in Mexico City: exuberant Aztec song and dance, mariachis, contemporary music, heartfelt interviews and insightful words from Church leaders. You�ll see the creation of an exquisite work of art: a nine-foot statue of Our Lady of Guadalupe that is the focal point of a new shrine in the United States. And you�ll witness how Our Lady of Guadalupe is touching many hearts beyond the borders of Mexico. Here it is by popular demand: A Sing-A-Long for Little Children! This live-action music video is from the best-selling Prayers for Little Children, The Rosary for Little Children and A Christmas for Little Children. And it includes four brand new songs. That�s twelve songs in all! Here�s an opportunity for your children to know Jesus intimately! Through traditional and original prayers, stories and songs, your little ones will learn the joy of daily prayer. Prayers for Little Children is hosted by Broadway and Hollywood actress Jennifer Naimo. In this video, Jennifer invites your children into her prayer room for a closer relationship with God. They'll meet saints, colorful friends and together begin their journey of prayer. Plus animated encounters with St. Francis of Assisi, St. Bernadette and St. Patrick; the story of Daniel in the lion�s den and a special lesson in quiet prayer. Prayers for Little Children is produced by the makers of The Rosary for Little Children and A Christmas for Little Children. Through these national award-winning videos, Jennifer Naimo has helped more than 100,000 children with their prayer lives. Now your children can experience this enormous power in Prayers for Little Children! Here it is! A video your child will watch over and over again-with lasting rewards! The Joyful Mysteries of the Rosary, a reflection on the early life of Jesus, has been a mainstay of Christian prayer. And now, in this video, that same rosary is a source of joy for God�s littlest children. In The Rosary for Little Children, your child will join a lively chorus of children in a heartfelt journey to Jesus. Led by a heavenly visitor, portrayed by Broadway actress Jennifer Naimo, children will learn the mysteries of Christ�s life. And they�ll learn how to pray for their families, the Church and children with special needs. Original music and exciting visuals are guaranteed to keep your little one�s attention. You�ll find yourself watching and praying with your child! THIS DVD IS PLAYABLE IN ALL REGIONS. Who is the real Jesus? Did the church in the fourth century change the true message of the Gospel? Was Jesus married? What are the Gnostic Gospels? Did Leonardo Da Vinci plant secret messages in his paintings? These and other questions are answered in this fascinating Bible-based video comparing the Christ of Scripture with the Jesus of The Da Vinci Code. This series presents the historical and Biblical facts that refute the errors and distortions popularized by The Da Vinci Code. Mary Magdalene's past experience helps her face an uncertain future. Noted actress Maureen O�Sullivan portrays Mary Magdalene traveling from Jerum to Galilee in AD 64. This lonely survivor is one of the few left who saw Jesus arrested and crucified. The passage of time has left her haunted by memories of death. Her spiritual strength and faith have eroded and are overshadowed by despair. This fascinating woman is touched and transformed by the discoveries of her journey. The people she meets and present realities dredge up past memories. Her despair is challenged by the spiritual faith of a new generation of believers who celebrate the Lord's living presence. Others who question or deny the validity of the faith force her to relive the events she experienced as a younger woman. She is strengthened and reassured as she joins her life to others. Her past, present and future come together as she relives the powerful moment of Jesus' resurrection. She who was among the first to see the risen Lord finds a surge of new life and a renewal of faith. What began as a journey of despair ends with her return to serve the living God. Lourdes is the most famous of all shrines to the Virgin Mary. But Lourdes is not about spectacular "miracles." Lourdes is about physical and spiritual healing, recollection, prayer and inner peace. This new documentary captures the daily spiritual rhythm of Lourdes - the Procession with the Blessed Sacrament, the Way of the Cross and the torchlight procession. There are interviews with pilgrims which give witness to the deep spiritual meaning of the experience of Lourdes. The King is Born is a video classic about the birth of Jesus based on the Bible. Beginning with Gabriel announcing God's blessed plan for Mary, this video brings all the elements of this timeless story to life. Journey with Mary and Joseph to Bethlehem and witness the humble birth of our savior together with the shepherds. The year is A.D. 64 € and in Rome, the church faces fierce persecution. Driven into hiding, Christians gather wherever it�s safe. 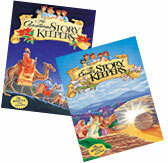 At secret meetings, they learn about Jesus of Nazareth -thanks to courageous leaders known as The Storykeepers. Episode 4: Ready, Aim, Fire! It�s excitement, laughter, and white-hot action when Ben and his family find themselves the object of Nero�s latest neighborhood renovation € firebombing by catapult! This harrowing adventure is punctuated by three stories of Jesus told only as The Storykeepers can tell them. A secret search for Justin�s father on a Roman slave ship leads to high sea adventure for Ben, Helena, and the children. Trapped aboard the galley when it leaves port, they find themselves headed for battle against a rebel slave ship. It�s a true lesson in self-sacrifice when a clash with the rebels threatens to send them down with the ship. Ben, Helena, and the kids narrowly avoid capture by Nero�s soldiers when their wheel breaks. While the wheel is being mended, Ben and Helena take the kids on a journey back to the days of Mary and Joseph and tell them about the birth of Jesus, the shepherds and angels, the Magi and the star, the flight to Egypt, and more. Dan Brown�s Best selling fiction thriller The Da Vinci Code ignited a world-wide controversy with his opening statement..."FACT: All descriptions of artwork, architecture, documents and secret rituals in this novel are accurate." But everyone wants to know - Is the novel really fact or fiction? Was Jesus really married to Mary Magdalene? Was she one of his disciples? Did they have a child together that became France�s royal bloodline? Did Catholic secret societies hide these and many other secrets about Jesus? Were famous people like Leonardo DaVinci and Sir Isaac Newton in on the secrets? Did Leonardo try to warn us through his The Last Supper painting? Discover the answers. Based on three best-selling scholary books - The DaVinci Deception (Erwin Lutzer), Breaking the DaVinci Code(Darrell Bock), and Cracking DaVinci�s Code (James Garlow & Peter Jones) - this program solves a 2000-year old mystery and sustains your faith in Christianity! This docu-drama answers all the lingering questions and exposes all the deceptions in Dan Brown�s novel through interviews with book authors and the world�s leading experts in theology, archeology, art history, philosophy and science. Viewers will be fascinated by the new evidence that reaffirms the reliability of New Testament Christianity. This program will satisfy your curiosity, engage your imagination, and provide insights for strengthening your own faith in biblical Christianity. Tour the monasteries and chapels mentioned in the novel. Church-wide Bible Study for Pre-teens, High Schoolers, and Adults. The Touch: After years of shame and isolation as one "unclean" with an issue of blood, a woman hears of the Master�s coming. Desperate to have a life without scorn and contempt, the woman feels impressed to touch His robe, confident that this small act can make her whole. Her faith is rewarded as He notices her act of faith and heals her. The Sisters of Bethany: Mary and Martha, who together with their brother Lazarus are good friends of Jesus, face a test. Lazarus has fallen ill. Urgently they send for Jesus to come to his aid; however, He delays the journey, and Lazarus dies. The sisters depair with Lazarus� death. Anxiously they await Jesus� coming to comfort them, and confront their personal trials of faith and submission to God�s will. Elijah and the Widow of Zarephath: A desperate young widow, seeking means to provide meager sustenance for her son and herself encounters the prophet Elijiah. His entreaties challenge her faith when he asks her for the last scrap of food she possesses - a bit of meal and a drop of oil; it is the last meal for her and her small son. As she exercises her faith and shares their meager resources with God�s prophet, the widow and her son are blessed. Lourdes is flourishing with many pilgrims, and Bernadette leaves to enter the convent of the Sisters of Nevers to dedicate her life to God. film reveals the incessant illness and suffering that St. Bernadette patiently, even cheerfully endured throughout her life in the convent, often repeating her prayer "to suffer and offer it to God." After her death in 1879 at the age of 35 years old, when her body was exhumed years later, she was found to be incorrupt, and her body was enclosed in a glass case that resides in the chapel of the Sisters of Nevers where millions have come to see the "little saint of Lourdes." An EWTN Classic Documentary narrated by Ricardo Montalban gives true global perspective to our Blessed Mother�s dramatic appearance, now almost 90 years ago, to three young Portuguese children. Historical footage from World War I and II, and news clips of " the day the sun danced" on the Fatima countryside in October 1917 are interwoven with excerpts from the timeless Warner Brothers� film, and interviews with eye-witnesses to the miracles which occurred during the Virgin Mary�s apparitions. Join Fr. Antoine Thomas as he leads a lively discussion group with children on such topics as: the Mass, the Rosary, Eucharistic Adoration and private prayer. Parents and teachers will welcome Fr. Antoine's instruction as a much-needed resource in the spiritual education of their children and students. This DVD is for all who want to help young children come to know and love their heavenly Lord in the company of His Blessed Mother. Fr. Antoine Thomas leads a group of mini-meditations on Jesus and how to respond to Him while praying the Rosary. Beautiful piano music and drawings of Jesus' life serve as a lovely complement to the recitation of the Rosary. Children will want to watch this again and again. Join Mother Angelica and the Poor Clares as they recite the Joyful, Sorrowful, Glorious and Luminous Mysteries of the Rosary. Taped at the Shrine of the Most Bless Sacrament, these Cloistered Nuns lift their hearts and voices to our Lord for the intentions of the world. Mother Angelica leads each of the decades - an added touch of love to this already exquisitely beautiful devotional. He was just a man, appointed by God to be the husband of Mary and the chosen father of Jesus. But in him, we see a man of uncompromised obedience, a prayerful man, an exemplary worker and a true model of authentic manhood. This program explores all aspects of St. Joseph and the many ways in which he reflects the nature of God. Here is the story of Christmas, told as only the Storykeepers can tell it, with tales of Mary, Joseph, Baby Jesus, Herod, the Magi, the Shepherds, and the later ministry and astonishing miracles of Jesus - all woven throughout the Storykeepers' own action-packed adventures. From their night-time journey to the seaport of Ostia, to the blazing deserts of North Africa, our heroes are headed for excitement, laughter, and hair-raising clashes with the forces of Nero. Surprises, thrills and wonderful, warm times together are in store for the whole family in this rousing adventure. In the dark days of Roman persecution, Christian storykeeper Ben the Baker and his friends spread the inspiring tale of Easter and of Jesus' death and resurrection. This action-packed story will captivate children while it teaches them about faith, family values and the importance of the Easter holiday. She was a humble girl from an ordinary Jewish family. Yet Mary came to be exalted as the Daughter of Zion, the Mother of God, and the Queen of heaven. All because this simple girl said a simple word: Yes. Follow Mary�s extraordinary journey on location in Israel, Turkey and Greece with popular Catholic author and speaker Stephen Ray as your guide. Together you�ll travel the dusty paths that took Mary to the heart of the salvation story. Discovering the Mary of the Bible will help you to know and love her Son. You�ll clearly understand Mary�s Immaculate Conception, her role of intercessor, her Assumption into Heaven and more. All in an energized, high-impact adventure that�s a travel documentary, biography, Bible study, apologetics course and Church history study! A comprehensive study guide included. Join the adventure! From Jean Delannoy, one of France's foremost filmmakers, comes this top quality feature film production of the story of St. Bernadette and the apparitions of Our Lady of Lourdes. Actress Sydney Penny gives a beautiful performance as Bernadette, and the rest of the cast is equally surperb. Also stars Roland Lesaffre and Michele Simonnet. It is highly recommended by the Vatican as a "sensitive portrayal of a very moving story that deserves a wide audience." Shot on location in France with outstanding cinematography and a beautiful music score, this is the film that was chosen to be shown daily at the shrine in Lourdes. On January 23, 1999 Pope John Paul II concelebrated Mass at the Basilica of Our Lady of Guadalupe with 500 Bishops and 5000 priests. He delivered to them his Apostolic Exhortation, "The Church in America," which is a summary of the Bishops' Synod and the blueprint for our Church for the third millennium. This was perhaps the most significant event in the history of America since Our Lady's visit there in 1531! See and hear from Guadalupe Experts and the Pope: Fr. Frank Pavone (Director of Priests for Life), Dr. Warren Carroll (historian), Fr. Christopher Rengers (author), Brother Francis Kalvelage (author), Dr. John Bruchalski (pro-life doctor), Marty Rotella (musician), Msgr. Carlos Warnholz (Archpriest of Basilica of Our Lady of Guadalupe), and Dan Lynch (Guardian of the Missionary Image). Throughout Church history, the Virgin Mary has appeared during humanity�s most crucial times. Today, as mankind faces a cataclysmic battle between good and evil, she has come to guide us on the path to salvation. Join writer/director Sean Patrick Bloomfield as he leads you on a thrilling investigation of alleged apparition sites such as Medjugorje, Fatima, Lourdes, Garabandal and more. Is Medjugorje the continuation of Fatima as Pope John Paul II believes? How was Mary instrumental in the demise of Communism, and how does her plan involve the current crisis with Islamic terrorism? The Fruits of Mary answers these and many other vital questions. In this powerful and inspirational story of love, sacrifice and faith, follow the life of one of the world's most beloved figures, Mary, the mother of Jesus. Produced by Eunice Kennedy Shriver and Bobby Shriver, this network premiere aired on NBC in November, 1999. Starring Christian Bale, Pernilla August and Geraldine Chaplin. Region 1 DVD - United States, Canada, and US territories. Includes English, Spanish, and French language tracks. This insightful film, made for television, tells the story of the appearance of Our Lady of Guadalupe to the humble Aztec Juan Diego in Mexico in 1531. It vividly portrays the rich faith of the Mexican people and the great devotion at the Shrine of Our Lady of Guadalupe where Juan Diego�s cloak still hangs with the miraculous image of Mary imprinted on it. With outstanding animation, this program accurately portrays the story of Our Lady�s appearances to the three children in 1917. From the angel�s appearance to the Miracle of the Sun, the full story is so captivatingly presented that young viewers will want to watch it again and again. Here it is! A DVD of redeeming value! The Best of Little Children features Broadway and Hollywood actress Jennifer Naimo. Through these children�s videos, Jennifer has ministered to thousands of little children and led them closer to Jesus. In this DVD, your little children will learn to pray the Rosary, the Divine Mercy, the Angelus, the guardian Angel Prayer, the Memorare and many more. They�ll learn about Scripture, the sacraments and the saints. And they�ll sing along to more than fifteen songs including Joy to the World and Jesus Christ is Risen Today. Also featured is musical sensation Bernie Choiniere with his dynamic performances of Faith, Hope and Love and We Are The Church. 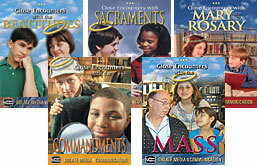 This DVD is guaranteed to help your children in their journey of faith. And they will be praying for your family, the Church and children around the world. The Best of Little Children is produced by Alan Hartwick and Wild Canary Sights and Sounds, the makers of dynamic Catholic videos. Here is the story of Christmas, told as only the Storykeepers can tell it, with tales of Mary, Joseph, Baby Jesus, Herod, the Magi, the Shepherds, and the later ministry and astonishing miracles of Jesus - all woven throughout the Storykeepers' own action-packed adventures. From their night-time journey to the seaport of Ostia, to the blazing deserts of North Africa, our heroes are headed for excitement, laughter, and hair-raising clashes with the forces of Nero. Surprises, thrills and wonderful, warm times together are in store for the whole family in this rousing 70-minutes Storykeepers adventure. With wonderful color animation, this film gives a lively and inspiring account of the moving story of Our Lady�s appearances to little Bernadette, the trials and misunderstandings that she faced, the important spiritual messages of Mary, and the wonderful miracle she performed at Lourdes. Highly recommended for young people. One of the most popular films of all time about the true story of the Von Trapp family of Austria and their narrow escape from the Nazi takeover in 1938. Julie Andrews is at her best with the immortal songs of Rodgers and Hammerstein, and Christopher Plummer is perfect as the unbending Captain Von Trapp. Gorgeous Alpine scenery.